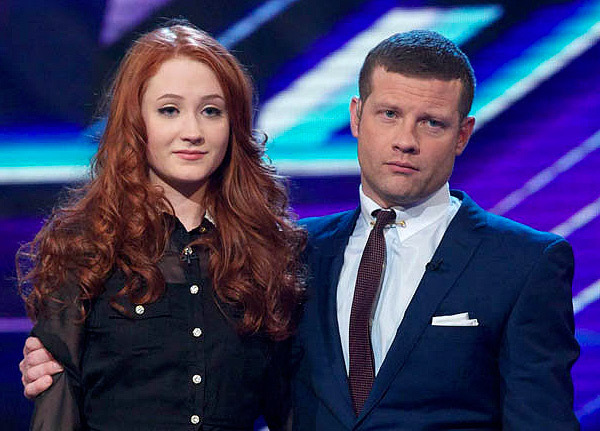 We were intrigued to discover, as the screening of Grace’s first-week audition established her as the early betting favourite, that she’s a housemate of Janet Devlin. She must have discussed with Janet whether or not to go on the show. And after Janet’s experience in 2011, it would be astonishing if Janet hadn’t offered some words of caution. We’d love to know how producers managed to convince Grace that the housemate’s tale would be a different one. Last week we discussed a Music Week interview in which Simon Cowell mused that acts must go through a “mental process” of “do we trust the show enough”. They must indeed: when you sign up, you effectively give up control of your identity for the purposes of the show. It’s not quite a matter of donning anonymising clothes and changing your name to Ofsharon, but the power of the edit suite is such that you can be made to come across pretty much however producers wish. Janet is the obvious example of this: it’s hard to think of another act on whom the show has done such a sudden and thorough 180. From the auditions stage to the second week of live shows, she was edited to come across as affecting, distinctive and talented. From the third to the eighth week of live shows, she was edited to come across as boring, weird and difficult. And because they’d done such an effective job of building her up, it took six weeks to bring her down. Fancy a trip down memory lane? Week 3: tabloid hacks tell Janet she’s not worth writing about. Week 4: Gary Barlow tells her she’s too predictable. Week 5: Gary now tells her she’s lost her identity; the VT shows her apparently annoying backstage staff and reacting sniffily to a suggestion of having fun. Week 6: Tulisa: “one dimensional”; Gary: “I’m losing interest”. Week 7: Janet is shown describing herself as “weird”, dissing popular music and apparently annoying the stylist. Week 8, song 1: switching on her hometown’s Christmas lights, Janet tells us she’s “not a Christmas person”; Tulisa: “mediocre”. Song 2: Janet bonds with boyfriend Brendan over their “odd” taste in music; Tulisa and Gary reprise “predictable” and “boring”. Twisting the knife after the singoff, Louis sends Janet home to save the act who will “give the most to the competition”, while Tulisa does so after pointedly musing about “potential when it comes to career after the show”. Admittedly, that probably has more to do with Simon’s ill-fated USXF distraction and the decision to start dicking around with the format by parachuting Amelia Lily back in halfway through. 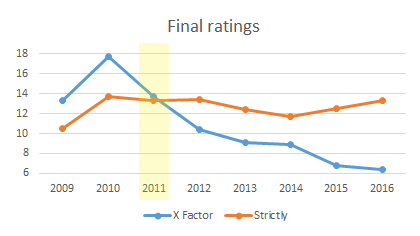 Still, one wonders what the X Factor’s ratings would be in some parallel universe where 2011 not only stuck to the 2010 format, but also treated the acts with 2017 levels of general positivity, in which takedowns have tended to be more subtle and dignified. 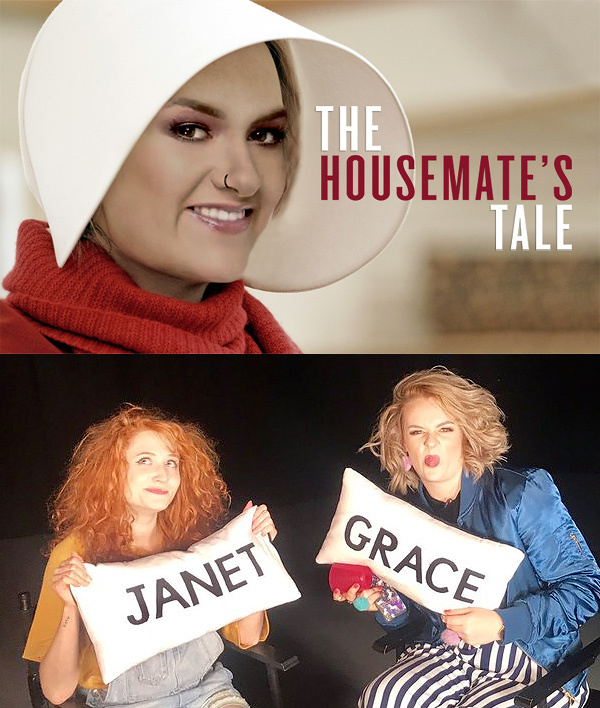 Because whatever producers told Grace about how the show has changed since 2011, they meant it: the housemate’s tale has indeed been a happier one. It looked ominous for the Langho lass a couple of weeks back, when the tabloids labelled her a stroppy diva (just like they had with Janet) and reported an ex-schoolmate calling her a “disgusting person“. But on the show itself, Grace has been treated with nothing but kindness. When doubts have been raised about individual performances, it has always been gentle and leavened by praise for her songwriting prowess. Her VTs have done a consistently excellent job of portraying her as warm, humble and funny. We’ve really taken to her. Whether it’s too late to arrest the ratings decline remains to be seen, but we’ve certainly enjoyed this kinder, gentler X Factor – and so, we assume, will talented songwriter-performers who are tempted by the adverts to apply for 2018. Praised be. 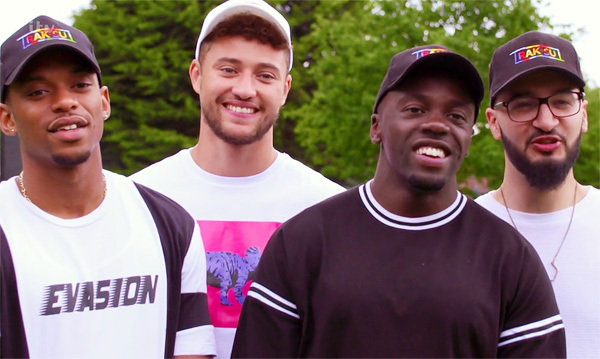 “On the subject of RakSu I don’t really get all the negative comparisons to previous groups. They’re head and shoulders better than anything there’s been before including Little Mix and JLS” – Alan. There’s not been a huge amount of love for Rak-Su in our comments section this series. Opinions often seem related to one’s financial investment, which is natural enough. Having been keen on their chances, we’ve been coy about banging their drum for fear it may be confirmation bias on our part. Besides, producers were clearly doing everything in their power to help the lads; there wasn’t any need to debate that. But with the final approaching, it’s time to give some credit to the Watford quartet, and the way producers have promoted them. The boys have given us four original smash hits on iTunes – ‘Mamacita’, ‘Dimelo’, ‘Mona Lisa’, and ‘I’m Feeling You’ – plus Rak-Sued two other hits: ‘Faith’ and ‘Flowers’. At one point, all six were in the top 25. Whatever your own thoughts, their shtick has been working well with plenty among the viewing public. Their journey during the live shows has been one of increasing momentum, with producers shrewdly easing their foot off the accelerator when necessary to dampen too much talk of favouritism. Judging not just by iTunes positions, but YouTube stats and Facebook likes, it’s worked incredibly well for them. Week 1’s ‘Mamacita’ saw many of the elements we’d see in later performances – Ash’s rapping and Jamaal’s vocals preceding Myles’ rapping, before finishing off with Mustafa body-popping. The boys started at the back of the stage, silhouetted by different bright colours. Gradually coming forward with some nice choreography, while looking spontaneous enough, it was all very professional. There was a four-judge standing ovation from the pimp slot, and that weekend they were beaten only by Grace in the prize fight and iTunes chart. Week 2’s more in-your-face Latin number ‘Dimelo’, was a triumph of staging, turning up the previous week’s elements a notch. Again they started in darkness at the rear, but this time to golden shafts of light through a huge open door. Later, there was prolonged interaction with the crowd on the edge of the stage, and sweeping low-level camera shots to emphasise audience movement and enjoyment. Gold spotlights basked their final step before a particularly effective high shot from the back showed the judges standing and a huge audience reaction. They won the night again, but lost the prize fight to the obvious disappointment of mentor Simon Cowell. Having had the penultimate slot then, putting the boys on first in Week 3 for a cover of ‘Faith’ represented the first easing on the accelerator. Staging was dialled down to ‘Mamacita’ levels, with added images of the lads on the backdrop and lots of fire. No judges stood afterwards, but they were universal in their praise. It’s fair to assume, from social media stats and iTunes performance, that they were the act Dermot alluded to being 1% behind the night’s winner, the heavily-pimped Kevin Davy White. Two prize fight losses and one on-the-night defeat meant there was still some uncertainty about their overall appeal. But Week 4’s ‘Mona Lisa’ was their biggest iTunes hit to date (it was at #1 for longer than ‘Dimelo’) and a prize fight winner. Back in the pimp slot, the song was chilled-out like ‘Mamacita’ but the staging was almost back at ‘Dimelo’ levels. This time with a big TV backdrop, backing dancers the boys only briefly flirted with, and pyros. Audience enjoyment extended to the other acts watching, and all the judges were standing once more. This was enough to allow producers to ease off the accelerator again for last week’s semi-finals, with slots of #3 and #2 in the running order. Only Simon stood for their cover of ‘Flowers’, while Nicole slightly dampened reaction to ‘I’m Feeling You’ by saying it wasn’t their best performance. Visually there were a few changes: ‘Flowers’ involved the lads starting among the audience, with Mustafa’s beatboxing to open; ‘I’m Feeling You’ was more typical movement-wise but with a Rak-Su car and slightly colour vomit-y backdrop making it feel more urban. Their logo was in lights everywhere. Their VTs throughout have been relaxed, mainly showing them bonding with each other and proving how close they are as long-standing friends. We were introduced to their Mums in week 1, and “Mum-Su” were interviewed in the studio during week 4. That same show’s dating profile VT was particularly effective in reminding us how unthreatening they are. Despite the plentiful rapping, their appeal has felt pretty middle-of-the-road. Last Saturday’s VT was also ingenious, as a drive through Watford provided an opportunity to reprise the hookiest sections of all their iTunes hits. 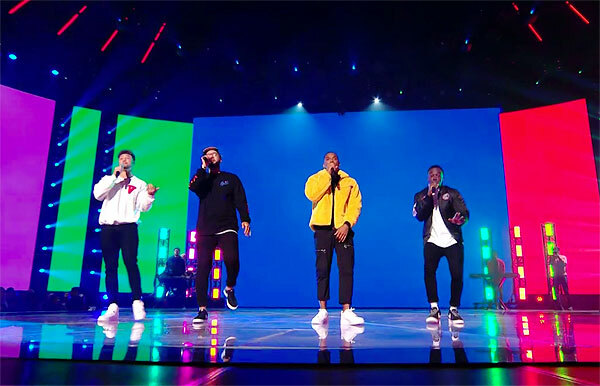 In short, week after week producers have ensured Rak-Su delivered catchy songs – mostly their own – and great performances. The lads are likeable, talented and bring something new to the show that it desperately needs. 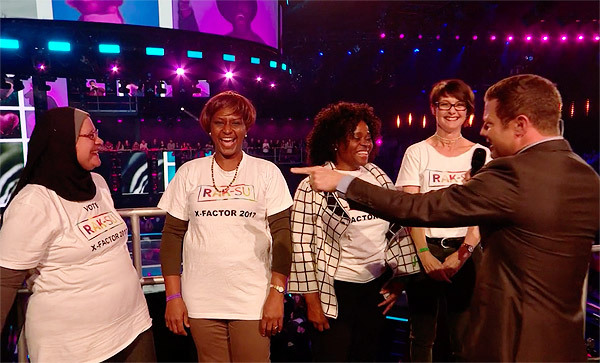 Of course, it’s the cheesy end of credible – this is X Factor after all – but they’ve arguably made this series worth watching more than any other act. “Who would’ve thought Kevin would be in the final back in week 1?” – Tom. “To think, after his dreadful week one song and staging (sorry no vacancy still makes me chuckle) could have had him out then” – Martin. 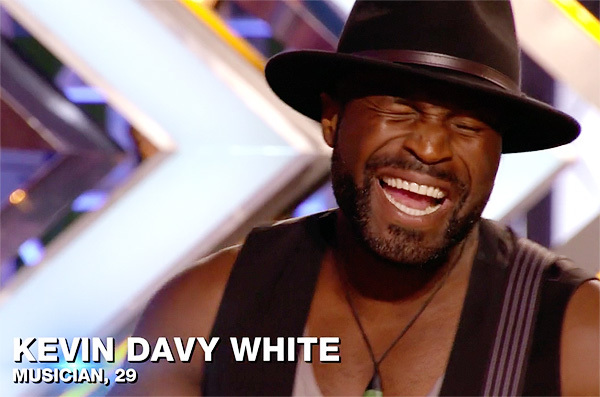 It would be fair to say that the rise of Kevin Davy White blindsided the Sofabet community. In our just-for-fun pre-lives attempt to predict the 1-16, Mech’s spreadsheet shows that our commenters’ average predicted finishing position for Kevin was 15th. Of the 45 entries Mech lists, 41 had Kevin finishing in the bottom half. Only one – hats off to Phil – pegged him as a finalist. Whenever an act’s live shows trajectory deviates this much from what we’d anticipated based on their auditions treatment, we always like to rewatch the auditions to see if there are clues of long-term plans we should have spotted, or if, even with hindsight, it looks like a case of producers’ plans having evolved. Are there elements of Kevin’s audition treatment we overlooked at the time? Possibly. 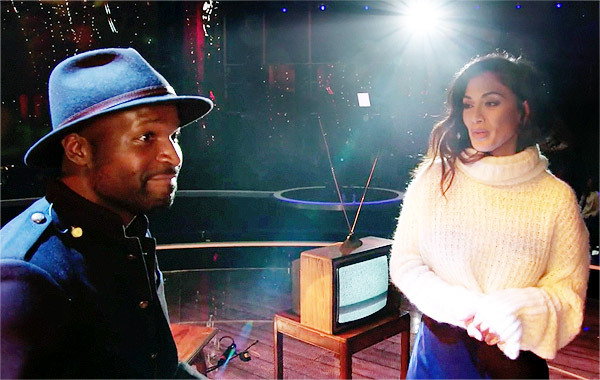 His room audition did feature a standing ovation from the watching fellow auditionees, and eventual mentor Nicole saying she would listen to his album – but then, this kind of stuff is hardly dished out sparingly in the room audition stages. Perhaps more intriguingly, Sharon hit a theme that would be repeated throughout the audition stages: he’s “not like anyone else”, she said. This presaged Nicole’s exchange with Stormzy after Kevin had performed at judges’ houses. Nicole: “I don’t know if we’ve ever had a bluesy artist on the show, have we?” Stormzy: “It could be that this is so fresh and different it blows everyone’s mind, or it could be this is so fresh and different that people don’t gravitate towards it”. At the time, we must admit, we found it slightly ridiculous to be enthusing about Kevin as “so fresh and different” on the basis of what we’d seen up till then – a belting, raspy voice and an acoustic guitar aren’t exactly groundbreaking on this show. Jimi Hendrix songs on an electric guitar are, however, groundbreaking. It’s oddly as if Stormzy was commenting about Kevin in light of a performance we wouldn’t hear for another few weeks. Perhaps our scepticism was rooted in the memory of an exchange at six-chair challenge. In hindsight it may be significant that Nicole again hit the button of Kevin being different, this time asking him what he brought to the competition that was “unique”. Kevin’s answer, however – “good vibrations” – didn’t sell us on his potential uniqueness. On the whole, though, we can’t be too down on ourselves for having missed Kevin’s potential at the audition stages, because we also rewatched the first live show, and it’s hard to avoid the conclusion that Kevin was on producers’ disposable list at that stage. He was sent out second in the running order, alone on a stage with an old-fashioned chair, and in front of a sign saying “sorry no vacancy”. The message hardly seemed subtle. His VT had shown him rehearsing with a malfunctioning old-fashioned television set, which all suggested that the creative brief for his staging must have read something like “dingy bedsit”. True, he got good comments – and that’s partly why, on rewatch, it still seemed clear that Talia was the intended target. But in a first live show, especially, producers have to allow themselves a margin for error – and if Talia’s vote had held up better than they expected, Kevin would have been the next most obvious possibility. We don’t see any reason to think that producers cared about protecting Kevin in the first live show. What changed? That first live show gave TracyLeanne every chance to establish herself as alpha over, and the fact that they gave up on her in the second week indicates that she must have performed too poorly in the vote to justify continuing the attempt. If Nicole were to have an act in the final, then, the choice came down to Kevin or Matt. Producers may have decided that it would be too risky to let Matt develop much momentum, given his much-noted resemblance to the Haenow/Cardle default-winner archetype. They may have seen Kevin more as the kind of act whose vote they could inflate and deflate at will. That certainly seemed to be the case in week 3 (when Dermot told us he won by only a percentage point, having been praised to the rafters from the pimp slot) and week 4 (when only a gentle tap on the brakes got him below Grace). If you buy the above analysis, to anticipate a Kevin win you’d therefore need to believe either (a) that he built up so much momentum over the semi-final weekend that it’s not worth producers’ while trying to stop him, or (b) that producers have changed their minds sufficiently about him in the last five weeks to give him the push he’d need for the win – in the process, pushing him above the two acts who have seemed top priority since the first week of auditions. As ever, do let us know your thoughts on the series and the upcoming final weekend in the comments below. It’s nice to be Queen of the Spreadsheet (until my huge blunders with Kevin/Grace get realized on the score and voting stats *presumably* swap the results in the double eliminations). Looks like Phil or Chatterbox will win this year. congrats! Maybe Simon’s modus operandi for the show since coming back is to have one surprise finalist every year: Kevin, Saara, Reggie n’ Bollie, maybe Fleur (although her JH did foreshadow big things). How do we make money on this pre-Lives? I’m interested to see how the show goes from here. Their year-on-year figures have been unfavourable but as a viewer, I felt like they did many things right. I always thought about how the show will function without a joke act (since introducing Jedward)… and this year showed us how they can do it without making the show boring, Louisa. I still think the show should take a break after series 15 and monitor how American Idol will work, but maybe post-show hype will still yield success for Rak-Su/Grace and stymie the viewership decline? You don’t need to pick acts like Saara and Reggie & Bollie pre-live. They were both at long odds well into the live shows. I can’t remember exactly what the prices were but I included them in my posts about those acts week by week. You can go back over old threads and see if you are so inclined. One problem with looking for outsiders on a forum like this is that the herd mentality takes over and other posters will jump in with ridicule and might make you doubt yourself. The good thing is that those acts are at such long odds you only need to risk a small amount and you can still get a mighty return. Who will finish in 3rd place? Kevin is 1/2 to finish 3rd. Running order and song choice will be very important, as usual. I wonder will they try and dampen Kevin to get a Grace Rak Su top 2? Duets are done before the first vote freeze apparently. I haven’t watched the show this year but going by what I’ve read on Sofabet (which to be honest is not that much) Kevin will get Rod Stewart for his duet. 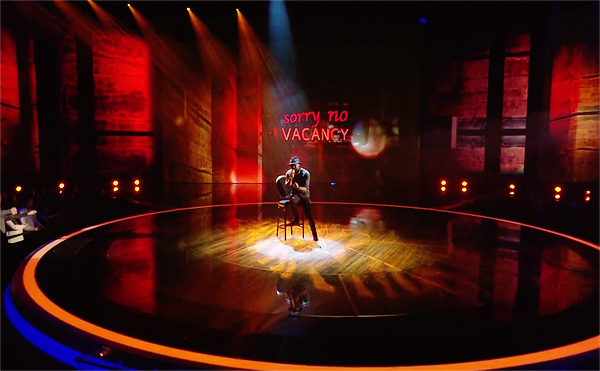 Kevin was definitely the target with “no vacancy”, it was not subtle. Do we have any other examples of contestants rising past these blatant attacks? i was at Grace’ homecoming gig yesterday. huge crowd, great atmosphere! she has a good live singing voice. really feel like watching a future superstar! however, show time was 5:45pm, but didn’t start til past 7pm, probably waiting for Mrs. Osbourne. but at least some good music being played while waiting. it has become a street party for young kids there. but it was quite funny when show finally started with our humorous Mayor holding long sheet pretending to give long speech before him introducing Grace, children were chanting “We want Grace! We want Grace!”, lol! anyway she sang her tracks Hesitate, Too Young, Wolves, & an encore of Too Young (again! as she won Prizefight with the song). she said her song Roots is reserved for the finale show. (maybe it’s her winner’s single!). however she later insisted that she wanted to sing it right in front of her ‘roots’. she even opposed the lyrics to pleased the crowd by saying “i know my roots WILL keep me warm!”. so she sang Roots in acapella, with audience singing along. There are a couple of Youtube posts of Grace’s gig. It reminds me of Saara’s from last year – only Blackburn doesn’t seem quite as glamorous as Helsinki. Also post from the Rak-su show at the Watford football match. Apparently there were huge crowds to see them at the home coming. However the idea for the performance seems a bit misjudged. Performing in front of a huge crowd may be a good idea, but when it’s a huge crowd of disinterested football fans not so good. apparently, they even got booed by some footie fans there. The Cutkelvins will be in G-A-Y (standard for all eliminated XF contestants) on Saturday. Does this mean La Gran Reunión won’t be until Sunday? Acts perform at G-A-Y at around 1.30am. oh yeah, night club. I stand corrected. Good article Daniel. Im still interested in what was the main motive of taking Kevin this far, Is there not a chance he is lined up to go into the final two as the foriegn act a bit like RNB and saara aalto to make it a easier win for the chosen one ? I think if i was in their shoes and the rak su win was the most important thing i would prefer kevin in the final 2 in a head to head rather then grace with an emotional performance of Roots on the final day. That would be the best tactic if they only wanted Rak Su…popular,fun,selling records, a group to win. But they also have a likeable,down to earth,very talented singer songwriter who could show a lot of “wow” this weekend. They are going to sign both…..let them battle fairly? 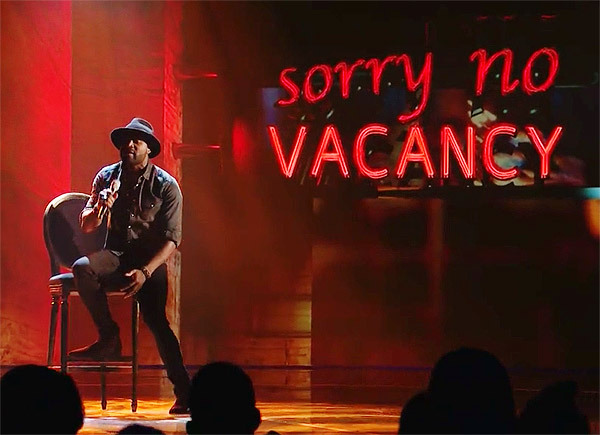 Not just “No vacancy” but the wild west/music hall font. I am sure they started with the view that Kevin was a no hoper who could be taken down any time. He proved them wrong with some talent and personality. Good. When is the 123 coming Daniel? Reading between the lines it seems to me that you’re swaying towards a GD victory, having been with RakSu previously? As things stand I’d have GD, Raksu, Kevin in that order…but I reserve the right to change my mind and my choice before saturday! Hey there Yolanda, we’ll post our analysis of the final with our 1-2-3 prediction on Saturday itself. Hoping to get song choices and duet details beforehand. 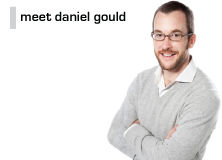 Ok thanks Daniel, I guess we can make a more educated prediction once we know the landscape a little better. I read through last years’s threads yesterday, to see if we could learn from some of the mistakes a lot of us made when predicting the order of the final three…unfortunately I’m now in a position where I could make a case for any of the six possible permutations! Let’s see if things are a bit clearer once the song choices etc are known. If Grace said at her homecoming gig she has reserved ‘Roots’ for the final night she must be confident of getting to the final 2? If she gets knocked out on Saturday she wouldn’t get to sing it, wonder if ‘Roots’ is her winners single. Live and let die?? Terrible choice. Not happy about that. Could be worse, it could’ve been Mull of Kintyre. Smacks of a show opener, fireworks, explosions etc, which McCartney does very effectively every time he performs it (to hide just how naff the song is, but people buy it). You see, I think Whole Lotta Love seems like a show opener! Interesting that Grace is performing two songs she hasn’t in the lives, while Rak-Su are doing two songs they have performed already and Kevin one. Not sure what to make of it. On the one hand, Rak-Su doing two of their greatest hits a third time might be a good thing, but is it a bit boring? Meanwhile Grace gets to do a proper version of her best song for the first time, and an new cover could go either way. Guess they must be doing the duets on Sunday, since they don’t usually do 3 songs each on the Saturday. Unless they’ve cut a lot of the unnecessary padding! 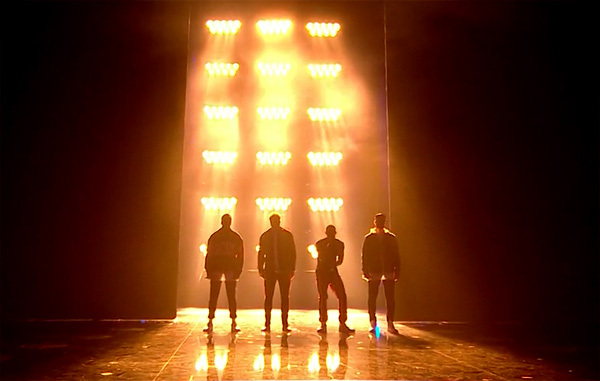 It would be nice if TPTB just played fair in the final for a change – surely they can assume that Kevin has no chance, and it really doesn’t matter that much which of Rak-Su or Grace wins if they are going to sign both anyway. Hmmm as a floating voter I’d say this swings me towards Kevin. Fast love could be the performance of the series. He will emerge as the best vocalist and probably the most credible and professional artist, with those song choices. People vote emotionally, not sure the “oh but they wrote their own song ‘ thing will motivate voters? Fast love, especially how he ended the song, was outstanding. Grace hasnt matched that in the live shows. Face it, she is not in the George Michael league of songwriters. Maybe I’m wrong. Live and let die for Grace! I’d have thought that’s a “put the brakes on ” song choice? If Grace performs first, who would bet on her to win ? ( note, ..I am someone who almost always gets it wrong, except for Leona and Sam bailey as winners) ! Grace received flowers from Robbie Williams. Will she get her dream duet partner tomorrow night? Rak-Su reveal arguments have got heated and they’ve kicked one member out of the bedroom. Robbie is jinx! 1D & Olly Murs… 3rd place. It can’t do her any favours getting hot and flustered over a man more than twice her age. He’s a great entertainer, but he certainly isn’t a good singer. If they wanted to make Grace look better, they would have someone who could bring the most out of one of her “brilliant original songs” and not someone who will strut around the stage like a coked up pigeon, winking and grinning. Robbie Williams is her dream duet partner?? She was 2 when Millennium came out. Not convinced. If Rak Su are gonna perform two of their songs they should of went with Dimelo and Mona Lisa because they sound slightly different. Mamacita sounds just like Dimelo and could be quite boring all in the same night. Song choices feel like everyone gets a fair crack. Duets and staging will reveal intentions. We already have an idea of how XF: The Path to Syco will run. Not sure how that translates to XF: The Show. Grace doing Roots. Although she is doing it in round 1 instead of 2. But the final is always won by day 2. I don’t buy in to this Roots fanwank that is being propagated by the DS hivemind. Sure, it will please the Grace fans no end.Stick a choir behind her, some understated production and it seems like you’ve got the perfect package. However, the song itself isn’t going to win over many new fans; it plods along, never really offering any peaks along the way, and slowly builds up to what promises to be a rousing finale….and then it ends, leaving the listener unsatisfied. As for the vote transfer…would it be a natural transfer of votes from a raw, male rock performer, to a ballad/MOR singing female quirky voice? It’s more likely than transferring to the modern rapping dance group with no real vocal ability. I’d say that all 3 are different enough from each other to be unable to predict with any degree of authority to whom these votes would go. I’d have to say they’d “cancel each other out”. This series the votes have gone wherever TPTB have wanted them to go. I don’t think you can second guess where Kevin’s votes are going to go until you see how the acts are treated. If Grace and RakSu are equally pimped then I tend to think Kevin’s votes will more naturally move to Grace. If RakSu get the chosen one treatment you can be sure thats where the votes will go. Why would Kevin’s votes naturally go to Grace? I don’t have a compelling argument either way, I’m just interested as to why most people are thinking this way. Its like a shopkeeper telling me he has no steak left and I can either have a can of peaches or a bottle of skimmed milk instead… there is no natural leap from one to another as far as I’m concerned. Because plenty of people, rightly or wrongly (I think wrongly), still believe that this is a “singing competition”, even after all these years, and still view it as such. There are many people over the age of 30 will not “get” Rak-Su, won’t like that they aren’t “proper” singers and those people won’t send them their votes. Kevin and Grace, by contrast, are both obviously singers/vocalists. Therefore I would expect the majority of Kevin’s votes to go to Grace, possibly by a fairly decisive margin. Thanks Tim, but aren’t you making two huge assumptions there? Are the people who are voting for Kevin doing so because he’s the best singer? He certainly wasn’t the best singer out of all the finalists – far from it – but he has made it this far, ahead of other better singers. On the back of what, then? Maybe his air of coolness. His back to basics approach. The fact it is just him and his music. I don’t know. For people over 30…even 40 and over. They were listening to the kind of music that rak su are making throughout the 90s and 00s, from rap, hip hop to garage and the new breed of RnB. To discount the voting power of this large group, or to assume it will go solely in one direction is dangerously dismissive. I’m not dismissing your argument, I’m just trying to find counter arguments to what are seemingly commonly held theories. I had a thorough read through last year’s threads and a lot of the assumptions made there were hugely wide of the mark (including my own, although I didn’t make my views known on this forum). I fear, however, that no matter how I dissect things, it will ultimately prove to have been an exercise in futility, as we are all undoubtedly at the whim of the master puppeteer’s desired plan. On one side you’ve got Kevin, a good singer and serious musician playing Led Zeppelin and Hendrix. On the other you’ve got RakSu doing light-weight catchy pop, rhyming Mamacita with fajita. Somewhere between the two sits Grace who doesn’t do serious rock music but plays the piano and writes and sings reasonably credible pop songs. It seems reasonable to assume that those that are voting for Kevin for his musical ability and more ‘serious’ sound are more likely to move their vote to Grace than the totally throwaway pop of Raksu. It’s a generalisation of course and is based on a lot of assumptions but I think it makes sense. That said it didn’t make enough difference for Grace to beat RakSu in their last prize fight so might not count for much in the final either. I’m making some assumptions, sure, but that’s just my reading of it. Rak-Su clearly have plenty of fans, but it’s difficult for me to say exactly which demographics their votes are coming from. The song choices put a lot of question marks around Rak-Su winning for me. There has been a lot of emphasis on original music and the iTunes charts. With Kevin doing covers again, the push for originality will impact negatively on him. Covers have also been performing worse on iTunes than originals. Rak-Su doing two songs they’ve already done in the lives will reduce the chances of songs their fans have already downloaded making the same level impact on the iTunes charts. Doing these two songs could also highlight how one dimensional they are in their songwriting. Meanwhile, Grace is doing a one up beat cover which allows for lots of backing, and her audition song which “wowed” the judges and caused Nicole & Shazza to use excessive levels of eye drops. Roots could easily be used to highlight the “original” tag, give Grace her “moment” with a 4 judge standing ovation as Nicole & Shazza weep with joy, give Grace an overnight lead, and reach number 1 on iTunes. The judges could then point out her success on the Sunday show. I still believe Rak-Su go into the weekend with the advantage, but if things play out as I expect, Grace could take the crown. Agree with what you say but why would the judges turn down the heat on RakSu for the final? Why would a Grace win suit their agenda more than a male group winning for the first time? There’s something about the latter that I feel TPTB would prefer and it’s certainly felt that way all through the live shows. I’ve always gone with the idea that they’ve been alternating between male & female winners in the last few years, so this year is female. I also believe Grace has a far wider audience reach than Rak-Su. I don’t think they’d be taken seriously in the US, whereas Grace might be. Of course, this could be played in the opposite way, with Roots failing to get the judges off their feet, and lukewarm comments bringing her back down to Earth. But looking at the songs makes me think Grace is growing into the final while Rak-Su are stalling. They’ll be on their feet for both Grace and RakSu. Guaranteed. They’re not going to go cold on them after all the effort they’ve put in so far. Id expect Kevin to get good treatment as well to be honest. Grace will have some great VT from her homecoming as well as her various visits. She can easily be promoted as the “people’s champion” if thats what TPTB want, without them “interfering” post performance. By all accounts, the reception was a little more luke warm for Raksu, but again, this can be edited as to how they see fit. I can see them standing for everyone, and making it all look nice, friendly and fair. Yep, last year they stood for every single performance iirc. Really surprised Rak repeating 2 songs whilst Grace has a new cover and Roots. Think this gives her maximum chance to try and overhaul the Rak lead we all agree exists atm. It certainly makes the final outcome less clear and more interesting. In the final Grace won’t lose support from her core fans by doing “Live and Let Die”. By this stage fans tend to stick by Thiers acts. But if it’s another more lively upbeat performance it may help her pick up votes from a wider audience. Rak-su will certainly hang on to thier core support by repeating two performances, but are is this going to be enough to pick up new votes? I feel like the producers are gearing Kevin up to win and I think he will win it. The public will see him as a deserving winner being the underdog having not had the over pimping that that Grace and Rak su have been given. He comes out as the more authentic musician. He’s been on a journey. Question is why would the producers want him to win. Is it possible that it is because the winners don’t tend to succeed off the show as well as those who haven’t won it? If Kevin wins the public will forget about him and Grace/Rak su will be signed and go on to great success. Just my theory. I’m with you Ray. I made similar points the other day. We might be wrong but I really do think this is not necessarily the two-horse race that 99 per cent of commentators are making out. It would make very little sense for them to rave about original songs all series only to have a cover singer topple two songwriters in the final. Sure, Kevin can write his own songs as well. But they aren’t showing them to us for a reason. I see Kevin as the Saara/ Luke Friend type of act. Pimped to become “the surprise finalist” in the latter stages of the show, but never enough to make win the show outright. He only won by 1% in his biggest week, so will struggle to win unless the other two finalists are deramped. Acts like 1D didn’t succeed as much as they did because they lost the show. All the winners that were outsold by their runners-up represent every act the show couldn’t overthrow using the amount of “tinkering” they did; they weren’t given a poisoned chalice so the losers get more sales. Ive decided to dip my toe back in on the basis that on final night I believe the British public will end up picking a winner that can actually sing. Usually this would be Kevin in a fair contest, however I can see them easing him into 3rd, with a large share of his votes transferring to Grace. And with Raksu singing 2 identical rap heavy songs with rearanged words I see them being beat in the final. 2/5 against the 3/1 for Grace suggests it being a foregone conclusion, I can see another odds on favourite being toppled in the final though. “Led Zeppelin didn’t write tunes everyone liked – they left that to The Bee Gees”. Yes that might make sense. All the Middle-England mums so beloved of this board are too busy watching strictly and blue planet. Brilliant for the show in terms of getting commercially viable winners. I don’t quite see how that’s the huge positive the article makes out. How many younger people exactly were they expecting to be watching Strictly, a show that aims itself squarely at a general and middle-aged audience? They may as well celebrate that X Factor is still getting more 16-34 viewers than Springwatch! The clear takeaway for me is that as more people switch off altogether and viewers fall to shockingly new lows, it should become easier and easier to predict which acts will take off as we don’t have to account for as many demos being as strong voting forces as they used to be. Having said that there is still the people that only tune in for the final and treat it as event tv. They may throw a spanner in the works on the night if someone not TCO is allowed to fly and appear as on the night, the best vocalist of the bunch. Tellymix appears to be confirming duets for Saturday. If so, I fear for Grace. Nicole is a duet assassin to every contestant she isn’t doing the duet with, and her and Kevin appear to have great chemistry. Male/female duets, when done properly, tend to create the best overall effect and vote grabber. Can it push Kevin above Grace? If they are desperate for a Rak Su win they should try to get Kevin above Grace. Think it is possible. Tokio Myers has self-confirmed for a duet on Twitter. Kevin perhaps? For the musician factor. If true then we can say goodbye to Kevin. Read the tweet. It is definitely Kevin. Song choices for today have already been revealed. They don’t usually reveal the song choices for the duets before hand. I can’t imagine any singer coming on and singing mamacita with rak su. Yeah I did consider this, but 9 songs in the show tonight does seem like a stretch? I know they’ve done it before but it was a while back. Maybe Honey G for Rak Su? I agree with Dazzle. I can’t see any singer duetting with Rak Su for either song. Add Little Mix in to the, erm, mix and you suddenly have massively increased the potential rak su vote. If this does happen, the writing is surely on the wall! Today’s show is 2 hours long. I think they could do 9. However they would have to throw all the guests on tomorrow. Maybe one or two today. Maybe they are doing what they did in 2015 when at the beginning of the show all 3 contestants walked through the crowd and performed about a minute of a song. Tokio could be playing the piano for any guest artist we don’t know if he is actually performing with a contestant. Likely to be Kevin but could it be Grace? Can’t see it being Grace. 2 instrument players duetting. Unless Grace and Rak Su get random people of the street I can’t see Kevin surviving. TPTB have learned their lesson after Matt Terry. Interesting use of the word “talented”. It sounds like she’s just being polite and isn’t really very excited by who it is. Definitely not going to be Robbie. Wouldn’t Live And Let Die suit Tokio more than Whole Lotta Love? Whoever gets him it’s a real deramp. They should all at least get to duet with an actual singer! Rak-Su have said on Lorraine their duet is with “a legend they grew up listening to”. Bound to be Craig. That was a tweet from Tokio, not Grace! Looked to see if I could find Kevin doing Whole Lotta Love on YouTube. Didn’t find one – but did find Nicole doing it! A Tokio/Becky Hill BGT/Voice duet could also be a possibility. Running order is crucial, as usual! For example, a great moving performance by one act can be kind of partially offset by a great moving performance by the act that follows. Maybe voting will open after the first song. Though I would think some people would wait until the last song to decide and cast their votes.